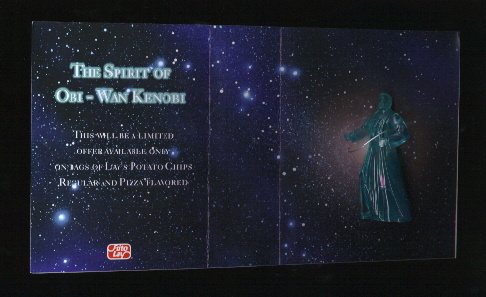 Collectors might not be aware that a "carded" version of the Spirit of Obi Wan mail-away figure was planned by Frito-Lay in 1996. 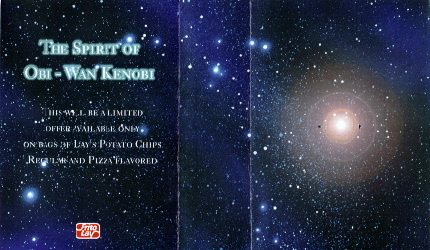 Prior to the Obi-Wan mail-in offer on specially-marked bags of Lays and Pizza Lays chips in early 1997, Frito-Lay had planned to produce several Holiday card Obi-Wan's to give away to Frito-Lay executives. 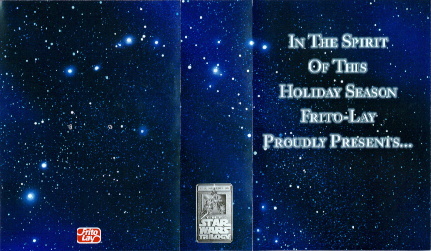 The cover of this holiday card is pictured above with the Star Wars Special Edition logo on the spine. These cards open like a book to reveal an Obi-Wan figure inside. The inside reveals an Obi-Wan figure tied to the card by wire. Unfortunately (for Frito-Lay execs), this internal promotion never got off the ground since the cards and figures needed to be ready by XMas 1996, and delays in the schedule prevented the gift from going forward. Very few of these sample cards are known to exist (four have been found). Unless Kenner decides to issue these Spirit Ben figures on card, these are the closest things to a carded version of the Spirit of Obi Wan figure.